While many of our members may be out at the lake, or camping, or visiting relatives over the three-day weekend, some of us are still in town. The Spokesman-Review has a listing of area events to honor our military dead, one of which is the dedication of the new Washington State Veterans Cemetery near Medical Lake. You might also like to check out my Special Offers page on my personal genealogy blog, AnceStories: The Stories of My Ancestors. I have a listing of all known sales, contests, and freebies being offered in the genealogy world this holiday weekend. Another activity you may like to do is to create memorial pages for free at the Find A Grave website for your ancestors and relatives. If you would like to really focus on your military ancestors, submit information to the Sons of Union Veterans National Graves Registration Database (they also take submissions for Confederate veterans), and/or the World War II Memorial. Both sites are free to use and submit information to, and great ways to memorialize the military veterans in your families. The latter accepts information about World War II -era individuals who served in some way towards the war effort, whether or not they were actually in the military. If you have a Rosie the Riveter or USO, Red Cross, or other volunteer in your family tree, be sure to honor them! Our own Carol Nettles did a great presentation on this website for a members-only computer class, and if you would like to receive the syllabus--or a Find A Grave syllabus I created--drop me a line here. Jeanne Jones Holder was EWGS President 1984 and 1985 (EWGS was 50 in 1985). Jeanne was born in Grandview Heights, Columbus, Ohio to Ira Stanton and Pleasant Alleyne (Higgs) Jones. She graduated from Grandview Heights High School, a B.S. in Education from Ohio State University and a Masters in Education from the University of Idaho. She was a teacher. In 1955 she met and married Robert Holder and they have two sons Mike and Bill and daughter Ann. Jeanne's hobbies are genealogy, gardening, knitting, traveling and her family. 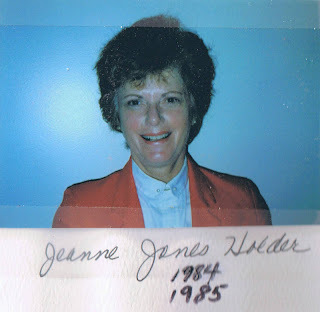 In a March 2, 1989 article in our newspaper by Beverly Vorpahl (another EWGS member), she wrote "Jeanne Holder is such an optimist that she believes almost anything can be done. A complete beginner at quilting, she nonetheless took on a tremendous quilting challenge. Holder had just joined the Washington State Quilters Association in order to learn quilting. She was also president of Eastern Washington genealogical Society and was constantly thinking of fund raising ideas for the group. The organization is concerned about personal history and also wanted to be part of the state's centennial celebration (1889-1989). One day, she came upon an idea that would tie all the elements together - a quilt which would depict some of the Spokane area's history. Not only would the quilt raise money for the genealogists, but it would also commemorate the state's history." I wrote about this quilt in the second Carnival of Genealogical Societies and it includes a picture of the quilt. In 1984 the primary project for EWGS was learning to use the computer donated the year before, many hours were donated to enter membership lists, the holdings, the I.D. Cards, etc. into the computer. The Presidents luncheon was held in June of 1984 in the Isabella Room of the Davenport Hotel. EWGS also had a summer seminar, Ronald Bremer was the all day speaker at Spokane Falls Community College. Cost $5.00. 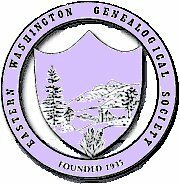 In August 1984 EWGS offered to hold the 1985 Washington State Genealogical conference, and so May 31, June 1 and 2, 1985, at Whitworth College, Spokane, Washington the WSGS conference was held. The October workshop was again at Spokane Falls Community College, and due to its chairman Donna Phillips it was a success. In the Fall of 1984 a German interest group was started and later a Scandinavian interest group began meeting. In 1985 EWGS had almost 400 members and about 100 at each monthly meeting. This was the 50th year for EWGS and with the WSGS conference a great celebration. I joined EWGS a few years later, and worked on a project with Jeanne Holder to index and then film records for the First Presbyterian Church, and she was always interested in how the project was going and making sure all the people working on this project were doing a good job. Glad I was able to know and work with Jeanne. Even if you’re not from the Spokane, WA, area, you might have fun peeking at posts about genealogy societies, local culture, and the Pacific Northwest. Thank you to Kaitlyn Cole and OnlineUniversities.com for recognizing the EWGS blog, and congratulations to the other winners! Ruby Simonson McNeill was EWGS President in 1982 and 1983 and was born at Colville, Washington to William Russell Simonson and Doris Mary Fay, both natives of Washington state. 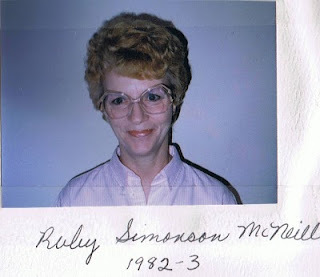 Ruby graduated from Ephrata High School and worked for Pacific Northwest Bell Telephone Company. She also lived and worked in Washington D.C.,for three years and while there met Duane Leslie McNeill son of Robert E. and Leota Junella (Schuman) McNeil and they married in Bakersfield, California, March 8, 1959. They have two sons, Dane Ladd and Rick Dean. In 1982 when Ruby became EWGS President she was known for her sharp wit and delightful sense of humor as well as her capable leadership. Dorothy Meyers Braithwait became editor of the Bulletin. EWGS also decided to designate June as a time to honor its leaders. A June luncheon was held and this became an annual event. The annual fall workshop was again held at Garry Junior High School with Donna Phillips as chairman. In the fall of 1982 it was decided to expand the hours of the library helpers to include the evening hours as a service to the working members. In 1983 the annual fall workshop was moved to Spokane Falls Community College to accommodate the growing numbers of people attending. During 1983 an offer by Kay and Kirsten Straight would bring EWGS a Corona Computer and Comrex printer. It arrived February 4, 1984. The Kootenai County (Idaho) Genealogical Society would like to announce the presentation "DNA and Genealogy" by Todd Neel during their meeting Thursday, May 20th, at the Hayden Library, 8385 Government Way, Hayden, Idaho. This presentation is free to the public and begins at 7:00 PM. Genealogy volunteers are also available to help researchers with questions at the Hayden Library every Wednesday from 1:00 to 4:00 PM. Wanting to join Facebook but not sure how to go about doing it? Already a member, but needing a little help with your settings? Thomas MacEntee of High-Definition Genealogy has created a Facebook for Genealogists cheat sheet. This free downloadable and printable chart gives step-by-step directions on how to create an account, edit your settings, monitor your privacy, and deal with annoyances such as hiding your birthday or deleting friends. Thomas will be our presenter for our annual October Workshop on Friday and Saturday, October 1 and 2 and will be speaking on Facebook and other technology-related tools for genealogists. Stay tuned for more information! Barbara Wirt Clarkson was EWGS President in 1981. Barbara was born in Redmond Oregon in 1923 to Harry M. Wirt and Jeannette Morrison. Although the Morrisons were from Canada, they were originally from Sweden. Harry Wirt's father George Wirt was from Germany. Barbara graduated from Central Valley High School and the University of Washington with a B.A. in Accounting. On June 21, 1947 Barbara married Ralph Earnest Clarkson, he was born in Greenacres, Washington in 1921 to Earnest W. & Blanche (Patterson) Clarkson. Earnest was born in Nebraska and his father Abner was from Illinois. Ralph joined Brown-Johnston Electrical Contractors in 1953 and later purchased the company. He retired in 1976 and died June 25, 1986. He served in the European Theater during WWII, and was a member of the Chapter 45, Disabled American Veterans, the El Katif Shrine, Orchard Masonic Lodge 200 and the Athletic Round Table. Barbara contributed bible records for the Patterson and Clarkson families and did a lot of Swedish research on her grandfather Peter Larson. In 1981 EWGS dues were raised to $7.00. A beginner's genealogy class was begun at 10:00 am on the first Saturday of the month, Julie Hendricks and Donna Phillips were instructors the first year. The day for the Library Helpers was changed from Wednesday to Thursday 10 A.M. to 3 P.M. A locality file was introduced so members could contact others researching the same areas. The annual workshop was held at Garry Junior High School with Donna Phillips as Chairman. 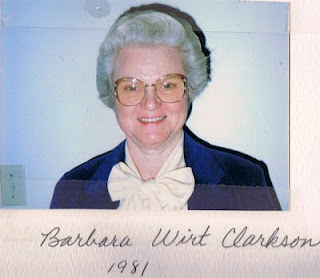 I remember Barbara at several EWGS meetings, and she was always interested in genealogy and in shy newcomers (like me). It's Not Too Late to Register for the May 15th Spring Seminar with Barbara Nuehring! You can still register for the May 15th Spring Seminar with Barbara Nuehring on the morning of the seminar at our registration table at 9:00 AM! The held Saturday, May 15th at the Country Homes Christian Church, 8415 North Wall Street in Spokane, Washington (see map at bottom of post). Registration is only $15 each for members; $18 each for non-members. No registration form is necessary. Either cash or checks made out to EWGS will be accepted. Syllabuses are not guaranteed. The last lecture will conclude at 3:30 PM. On Site Research: Ready, Set, Go! In addition to the lectures, door prizes will be handed out and a raffle will be held. There will also be a contest to name EWGS's new digital publication. This is a seminar you won't want to miss! For further information, please contact Miriam Robbins Midkiff by phone (484-6759) or e-mail. One reason most genealogical societies have been formed and flourished was because of collaboration. Genealogists getting together to help each other research better, and for educational opportunities. EWGS has also hosted Washington State Genealogical Society Conferences to collaborate with other societies and people from all over the northwest, but the longest and most fruitful collaboration for EWGS has been with the Spokane Public Library. Soon after EWGS was founded the members started contributing books and microfilms to the Spokane Public Library, and the library found a place for EWGS to meet. EWGS provided gene helpers so people coming to the library could get help from a genealogist. The Friends of the Library group was formed mostly by EWGS members, and it continues on today providing a lot of help for the library although I don't think many EWGS members are also members of the Friends of the Library anymore. Has the collaboration between EWGS and the Spokane Public Library worked? Yes, both groups have benefited, EWGS has not had to rent a building and pay utilities, etc., and the library has a large genealogical collection and volunteer helpers that free up the librarians for other work. 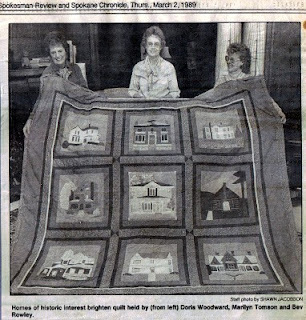 This picture is from the newspaper and shows collaboration between EWGS and the library, to make and sell a centennial quilt for an EWGS fundraiser. Tickets were a dollar and the winner was picked on November 11, 1989, the date of the State of Washington's 100th birthday. The Centennial quilt had pictures of nine houses built about the time the State of Washington became a state. All the houses are in Washington. The houses are the Perkins House, Colfax; the Kirkman House, Walla Walla; Boughton House, Dayton; Hallett House, Medical Lake; Mill House, Dayton; Colville Indian Agency, Chewelah; McInnis House, Davenport; McEachren House, Latah; and the Dexter House, Dayton. The library found pictures of these houses and the EWGS members selected the fabric and did the sewing. Written for the Second Edition of the Carnival of Genealogical Societies: Collaboration. 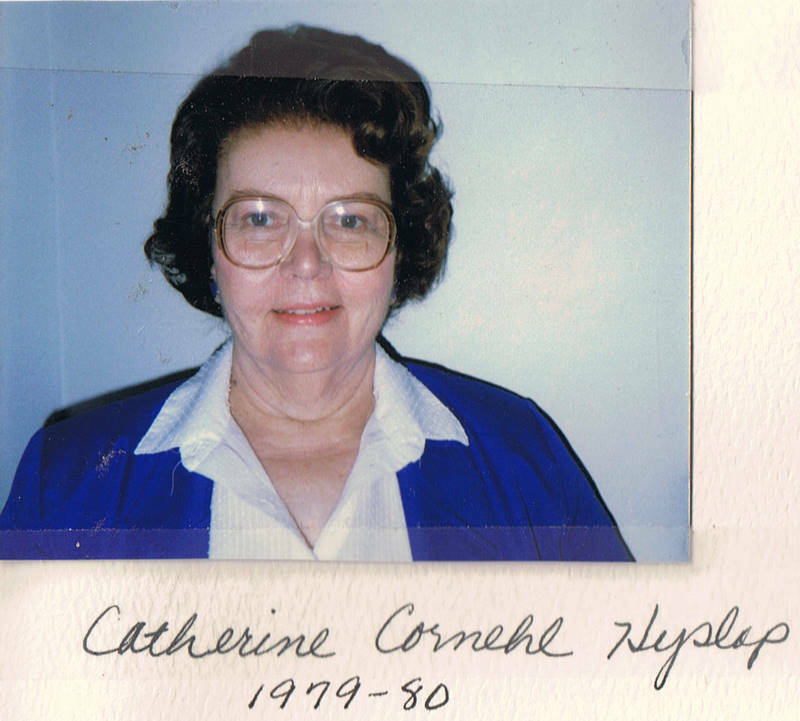 Catherine P. Cornehl Hyslop was the EWGS President 1979 and 1980. Since Catherine is still alive I will not give her birth year, but she is listed in two open census. The History of the Big Bend page 667 has a biography on her father Herman Cornehl of Douglas County. Herman was born in Hamburg, Germany, November 23, 1863 son of Henry and Annie K. (Schmidt) Cornehl, and in 1883 he came to the USA. He lived in San Francisco, Alameda and Fresno in California before moving to Oklahoma for the land rush. Then to Guthrie and Arkansas City, a short trip back to Germany and them to the Big Bend country. He was a merchant at Bridgeport, Washington and also raised stock on his farm near Bridgeport. May 18, 1904 he married Pearl Galbraith, daughter of G.W. & M.T. (Weaver) Galbraith from North Carolina and Texas. The Washington State Digital Archives has a lot of information on Herman Cornehl, but some was indexed as Herman Cornell, and after I notified the archives they have changed all the indexes to Herman Cornehl. April 12, 1938 Catherine married Thomas Hyslop here in Spokane at the First Presbyterian Church (more on that church later). Thomas was born in Deep Creek, Washington in May 30,1915 to V.R. & Esther J. (Hatch) Hyslop. He graduated in 1933 from Reardan High School and in 1938 from Washington State College. (Catherine was a student of WSC in 1938 also). Thomas served in WWII in the Army Air Corps and retired as a major. After the war he assumed management of the family farm until he retired in 1986. He was a member of Eastern Washington Historical Society, Westerners, Eastern Washington Genealogical Society, Spokane County 4-H, Inland Empire Council of the Boy Scouts of America, and the Spokane Downtown Rotary Club. He died December 14, 2002 and is buried at Fairmount Cemetery. In the 1979 Bulletin was a tribute to Carrie Lartigue. Carrie had joined EWGS in 1954. Carrie had been President. Treasurer, Librarian, Trustee, library helper and project chairman. Carrie was the person that commented on most of the earlier EWGS Presidents, but due to poor health stopped the comments before Catherine became EWGS President. Linda Shiflett became the new editor of the Bulletin, and the October workshop was held at the Red Cross Building and it cost $6.00 for a day long seminar. EWGS had grown to 303 members by 1980.